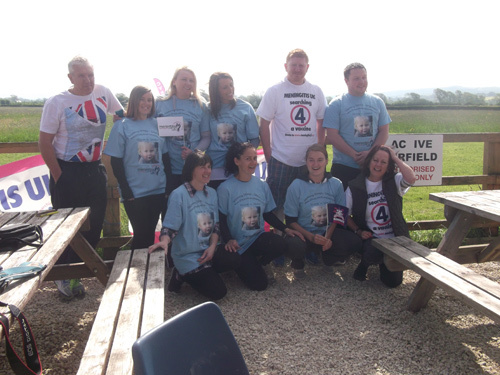 A DAREDEVIL mum from Downend has leapt 10,000ft from a plane in memory of her toddler son. 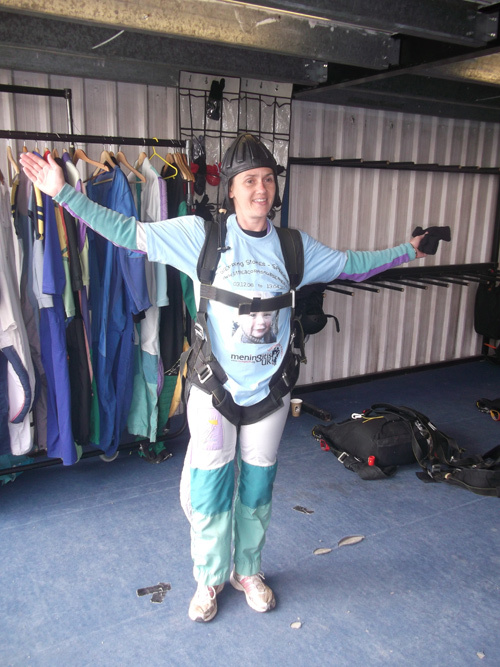 Despite being scared of heights, Sarah Johnson plucked up the courage to take part in a skydive to raise money for Meningitis UK after three-year-old Ryan died suddenly from the disease. 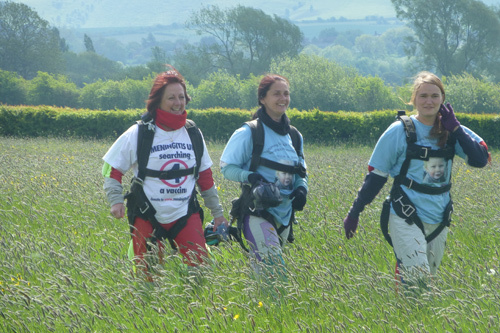 Sarah, 45, was joined in the air by 19 friends and work colleagues from Stepping Stones and Little Acorns nurseries in Speedwell, Yate and Thornbury. The jump had originally been planned for April to mark the third anniversary of Ryan’s death but bad weather meant the event had to be postponed. Sarah was first up and jumped with a friend and work colleague. She said: “The instructors were brilliant and put us at ease. I didn’t think twice I just knew I had to do it. “When I jumped all I could think of is how my little boy had brought so much sunshine into people’s lives and how he is still carrying on today bringing lots of joy because everyone was so excited. I did a big high five to him in the sky. And if Sarah appeared to have a special glint in her eye that day it was because she was celebrating the birth of her first grandchild, Tyler, who was born just days before. Despite Sarah’s husband Tyrone thinking her “mad” he was quick to congratulate her along with sons Cameron and new dad Aaron and daughter Lydia, who completed her own skydive last year. The money is still rolling in but the event looks set to raise at least £5,000 which will be boosted by a further £1,400 after a friend organised a fundraising day at the Live and Let Live pub in Frampton Cotterell. This means the family will have raised around £59,000 since Ryan’s death. 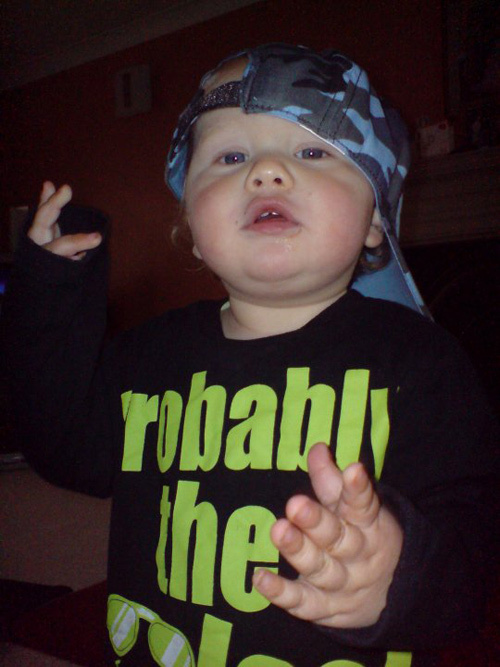 Sarah said: “Ryan was a cheeky little chap who brought sunshine into our lives. There’s a five year gap between each of my children but Ryan brought everyone closer together. “Fundraising helps as it gives us something to focus on. It also helps other people – they feel they are doing something of worth to help. 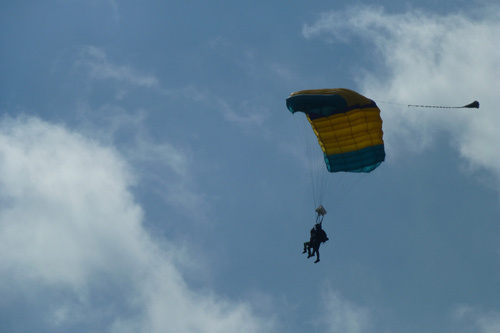 They would have never have done a skydive if it wasn’t for us asking them so it’s really nice to see that other people are getting something from our sad loss. 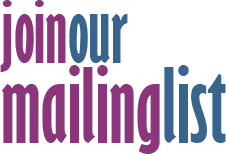 “We’re raising money for such a good cause and people are enjoying the fundraising events that we do. We hold a party on Ryan’s birthday each year and it’s nice to see people get together and enjoy themselves. “I see people smiling when we organise things and I think ‘That’s all down to my little Ryan – my cheeky little chap. He’s still there making everybody laugh’. Ryan, or RyRy as he was known to family and friends, died suddenly from meningitis and septicaemia on April 13 2010, just hours after first feeling ill. The toddler, who played in Soccer Tots in Kingswood, seemed fine as he enjoyed a day with his family, running and leading his sister’s pony around, and tucking into tea. But hours later he was rushed to Bristol Children’s Hospital with meningococcal septicaemia, the blood poisoning form of meningitis. Tyrone said they were in A&E just after 6.30am when they noticed a small rash under the youngster’s chin. Despite the best efforts by medical staff he could not be saved and Sarah and Tyrone’s “cheeky little chap” died surrounded by family. Sarah said: “Ryan had a lovely day, was laughing and joking, and at teatime ate all his vegetables and even asked for more. He was on the sofa watching TV and at one point had a little shake, but we thought he was just tired. Ryan was sick in the night and got into our bed. “He was restless, his eyes were twitching and couldn’t focus on me, so we rang the doctor, who said take him to the children’s hospital immediately. “After blood tests we were told it was meningitis – we just couldn’t believe it and just looked at each other. “The next time we saw Ryan the rash had spread across his body – it was that quick. Tyrone said: “It’s unbelievable that on the Sunday we had our happy, cheeky little chap as a healthy little boy and by Tuesday night we were having to make such a terrible decision. Kingswood-based Meningitis UK was formed in 1999 by Steve Dayman who lost his young son Spencer to the disease in 1982. In April 2013 the charity merged with Meningitis Trust to form the UK’s biggest meningitis charity.